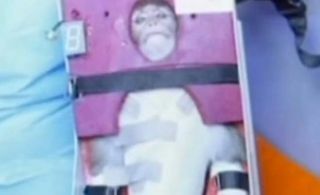 If Iran has indeed launched a monkey to space, the nation is following a path similar to that taken by the United States in the early days of its space program. Iran announced today (Jan. 28) that it had successfully launched a live monkey on a spaceflight and recovered the animal alive after landing. The move is a prelude to sending humans into space, which the Islamic Republic hopes to do by 2020, Iranian Space Agency officials said. Iran and the United States don't see eye-to-eye on many issues, but both have viewed monkeys as good astronaut test subjects over the years. The U.S. was the first country ever to launch a primate, sending a rhesus monkey named Albert to a sub-space altitude of 39 miles (63 kilometers) aboard a V2 rocket in June 1948. Albert died of suffocation during his flight, and a number of his simian brethren also sacrificed their lives to the cause in the ensuing years. Another rhesus monkey named Albert II, for example, became the first primate to reach space, achieving an altitude of 83 miles (134 km) aboard another V2 in June 1949. He survived the launch but died after a parachute failure caused his capsule to slam hard into the ground. Alberts III and IV died during their missions in late 1949, and Albert V was victimized by another parachute failure in 1951. Albert VI, also known as Yorick, survived his 1951 flight, though it topped out at an altitude of just 45 miles (72 km) — significantly below the generally accepted 62-mile (100 km) boundary demarcating outer space. Yorick died several hours after landing, possibly from heat stress suffered as he sat inside his cramped capsule in the New Mexico sun, waiting for the recovery crew. As the American human spaceflight program began to build momentum, the nation started experimenting with chimpanzees, which are larger and more closely related to humans than are rhesus, squirrel or other monkeys. The U.S. launched a chimp named Ham on a suborbital spaceflight on Jan. 31, 1961. Ham reached an altitude of 157 miles (253 km) during a 16.5-minute flight and was recovered unharmed, though a bit dehydrated. With this success in hand, Alan Shepard successfully blasted off on his suborbital flight on May 5, 1961, becoming the first American — and second human, after the Soviet Union's Yuri Gagarin — ever to reach space. The United States' space race rival, the Soviet Union, primarily used dogs in the run-up to its first human launches, thinking that canines would prove to be less fidgety in flight than monkeys. Despite its canine focus, the Soviet Union and its successor state Russia did launch a number of rhesus monkeys to space in the 1980s and 1990s, as part of a program called Bion. France also blasted two pig-tailed macaque monkeys to suborbital space in 1967. Iran's recent launch was not its first attempt to send a monkey into space. A previous orbital effort in 2011 failed.